A parrhesian periodical about peculiar people, published whenever the spirit moves and the purse permits. Salt Lake City, UT, then New York, NY. Publisher: A.T. Schroeder. 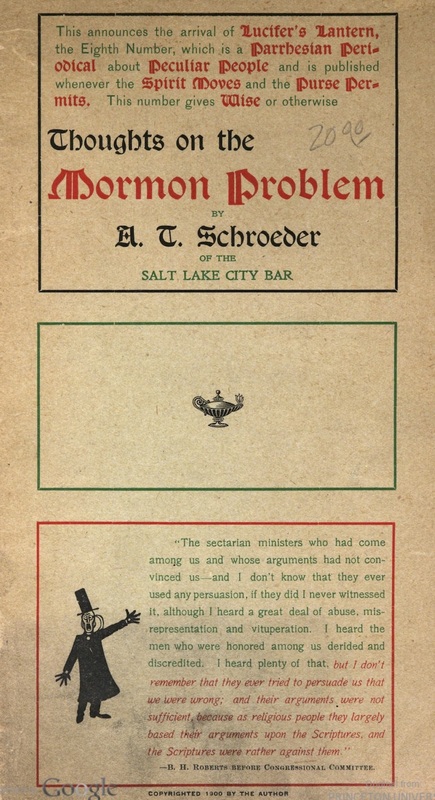 Editor: A.T. (Theodore) Schroeder. 1/1, June 1898-1901 (9 issues). 18-32 pp. (varies). This was an irregular series rather than a journal proper. It was the passionate vehicle used by Schroeder (1864-1953) in his attack against the Church of Latter Day Saints after he moved to Utah in the early 1890s to practice law and found himself utterly at odds with the church (which he regarded as a "laggard in religious evolution" and a lure for erotomaniacs) and its culture and history. He set out to correct the record by assembling a massive collection of everything (artifacts, diaries, journals, letters and books) related to early Mormonism and then publishing in this journal and elsewhere the the results of his research on topics like the authorship of the Book of Mormon, counterfeiting and use of intoxicants in the early church, proxies in Mormon polygamy, and Joseph Smith as an abortionist. In 1900 he moved to New York, stopped practicing law, and devoted himself to "evolutionary psychology," radical politics, free speech and feminism, and his theories of the "erotogenetic" basis of religion. He is best known for his expositions of the sexual ideas of "Ida C" (Ida Craddock) but in his hundreds of articles he touched upon a great variety of other contemporaries with outre ideas on sexuality and ecstatic experience. NYPL (microfilm); Yale University; Carnegie Library, Pittsburgh; Case Western University; University of California, Santa Barbara; Princeton University, etc.